Introducing the ONLY Conservative Newspaper in Ohio! Introducing The Ohio Star, Ohio's first Conservative newspaper! Click on this link to register for a FREE Subscription and have the newspaper delivered to your email inbox every morning! Finally a newspaper conservatives will enjoy reading! A newspaper that treats President Trump fairly and actually discusses the amazing things he has done and is doing to make our nation prosperous and free. A newspaper that actually covers Ohio State politics from a conservative view point - imagine that!!! Here is the best part, in Ohio we basically have seven liberal newspapers who spend all their time bashing the President and every Republican candidate. Since 53% of Ohioans would elect President Trump again this year, if he were on the ballot, if those conservatives all subscribe to The Ohio Star, it will become at least seven times more readers than any other newspaper site in Ohio!!! Finally, Ohio citizens will get real, truthful, news. If you are a conservative, please signup for your FREE Subscription to The Ohio Star TODAY! Then read it every day so you can see what is really going on in our State for the first time! View the Archives ANYTIME from ANYWHERE on your IPad, IPhone, Android Device or Computer! Listen on the Radio Every Saturday 9:30 AM and again at 10:00 PM on 1220 AM WHKW Cleveland and from Anywhere on IHeart Radio! I find this website very useful in my research . . .
Akron, OH: Today, Tom Zawistowski, President of the Ohio TEA Party affiliated We the People Convention, announced that Ohio TEA Party Groups would be once again partnering with the National Rifle Association (NRA) Political Victory Fund to help elect Ohio Republican federal candidates in the 2018 mid-term elections this November. The two groups successfully worked together in 2016 to help President Donald Trump win the state of Ohio. In making the announcement, Zawistowski said "Our relationship with the NRA in 2018 will be the same as it was in 2016. We supply the people, they supply the resources we need to contact voters and persuade them to get out and vote for conservative candidates. Our goals this year are clear. We will work to elect Jim Renacci to replace Brown as Ohio's U.S. Senator, we will work to re-elect the 10 incumbent Ohio Republican Congressmen, and we will work to elect the two Republican Congressmen running to fill open seats in Republican Districts. Our people will work with the NRA-PVF first to make calls in Ohio and later to knock on doors as the election draws near. All citizens, and particularly those who believe in protecting their second amendment rights, can join our efforts by signing up at nragrassroots.ivolunteer.com." Zawistowski continued, "For the TEA Party in Ohio this election is real simple. President Trump is carrying out the agenda we elected him to implement. This November we will make sure that we act to protect his Presidency, and our own best interests, by retaining Republican control of the U.S. House and adding to the Republican majority in the U.S. Senate. Conservatives want to make the tax cuts permanent, build the border wall, reform immigration law, support law enforcement at all levels, replace Obamacare with a competitive and efficient private sector health care system, reform our education system, reform our courts and prison system, re-establish "equal justice for all", reduce the size and regulation of government, retain our national sovereignty and Constitution, and restore regular order in Congress. The Democrats want to take back our tax cuts, re-impose government controlled health care, eliminate our borders and let millions more illegals take jobs from Americans and drain government resources, eliminate law enforcement agencies like ICE, re-regulate all businesses, take away our guns and our Religious Freedom, undermine our Constitution by moving increasingly toward socialism and then communism, and then try to impeach President Donald Trump. We are confident that the majority of Americans, who are benefiting greatly from the President's policies, will come out and support him by electing Republicans in the November election and we will do all we can to make sure that happens." Will you do your Duty this year? I write to you today, to bring to your attention the challenges that lay before all of us, and to remind you of your Duty as a U.S. Citizen and as an Ohioan. I will not mince words. Neither you, nor I, nor anyone we know, are truly "excited" about the vast majority of RINO Republican candidates running in our state for federal, state or local office. We are not fooled, the Republican primary was a joke. The Republican party did everything it could to keep people out of races, or force people out after they got in, or to put their fist on the scale to make sure that only the big monied, special interest backed establishment candidates won. We get it. We lost that fight and now we have to move on to the next fight. Many of you will remember in 2016 that Donald J. Trump was not the first choice for President, or our second, or the third choice for many conservatives. However, once he had become the Republican nominee those who cared about our Constitution and our nation understood that it was our Duty to vote for the candidate who was most likely to do the things that we wanted to be done to protect and defend our Constitution and our Liberty. I remember writing to you, and talking to groups and leaders all over the state and our nation, explaining that we had to vote in our own best interest, and the best interest of our nation, and not for the person or in Trump's case the personality. It was a persuasive argument and it resulted in record numbers of Christians and Evangelical Christians coming out to vote for a man with many moral flaws but who pledged to defend their Constitutional Rights - and after being elected he has done that in spades! While it was difficult for many to do, it was our Duty, our moral and legal obligation, to vote in our own best interest and the interest of our nation. In 2018, in this mid-term election cycle, one thing is crystal clear - YOU and EVERYONE YOU KNOW needs to vote for EVERY REPUBLICAN on the ballot whether you like them or not. I mean what I said. Why? First, because EVERY Democrat on the Ballot has vowed to stop President Trump, or in the case of state and local races to continue to push their statist big government, high tax, divisive leftist identity politics agenda on YOU and your family. They are not "Democratic Socialists" they are Democrats who are now Socialists! Second, because our only hope right now is to protect President Trump by holding the US House and Senate and keeping a Republican controlled state government for the 2020 election. That means that we have to hold all 12 Ohio Congressional seats, we must elect Jim Renacci for Senate and throw Communist Sherrod Brown out after 40 years living off our public dollar, and with a little extra work take out one or two of the four Democrat Ohio Congressmen! So, here is what we MUST DO. First, next Tuesday, on August 7th, their is a special election for US Congress in the Ohio 12th District between Republican Troy Balderson and the Democrat. We can not lose this seat - even if the winner will only be in office until the end of the year! Why? The Left wants you to believe that there is a "blue wave" of Democrat support that is going sweep Nancy Pelosi back into the Speaker seat in a Democrat controlled US House. Our polling shows clearly that there is no "blue wave" in Ohio, however, with a summer special election, which generally have very low voter turnout, the Democrat could steal this Republican seat with very few votes and then all we will hear on the national news is BLUE WAVE! This will be BAD for you and I and our nation and our state, because that will cause tens of millions of dollars to come into Ohio for every Congressional race and the Senate race in Ohio that otherwise will not be here in the fall to be used against us. If you are in the 12th Congressional District, I need you to get everyone you can to get out and vote for Balderson on Tuesday. President Trump is coming to Delaware, OH on Saturday, August 4, 2018 at 6:30 PM to campaign for Balderson you can register here. If you are outside the 12th Congressional District but know anyone in it, please call them or forward this email to them and ask them to get out and vote on Tuesday and bring others with them! We must win that election! Second, we are going to be teaming up with the NRA Political Victory Fund again this year to elect Republican federal candidates in the fall. I will have information for you next week about how you can call voters from home to urge them to vote for Jim Renacci for Senate and for the Republican Congressional candidate in your area. We are less than 100 days from the 2018 election and we need to start letting our fellow Ohioans know what is at stake for them and our nation in this election. The Democrats are running on a platform that supports taking away your tax cuts, re-implementing Obamacare, opening our borders and our cities to anyone who wants to come in, re-regulating industry, appointing radical Judges at all levels who make law from the bench, and impeaching Donald J. Trump! We can not allow any of that to happen. Let me close with an analogy. In 2016 it was like landing on the beaches of Normandy in World War II. We had nearly lost our nation to the communist left and by electing Trump we had established a beachhead to start retaking lost ground. This year, if the Socialist Democrats can take back the US House, with the help of the Republican Establishment like the Koch Brothers, they will push us back into the sea and our nation will be lost - forever! Believe it. There will be no wall, there will be no rule of law, there will be no United States of America if we lose. If we hold our ground in the 2018 mid-term elections, we will then be able to retake even more lost ground over the next two years by appointing more Supreme Court and lower court Justices, by building the wall, by making the tax cuts permanent, by keeping our economy booming, by defeating the deep state and re-establishing equal justice under the law. That will put us in a position to win a land slide re-election for Donald Trump in 2020. It is my sincere hope that after we hold our ground in 2018, that Donald Trump will see that he needs to help us reform the corrupt Republican Party and in 2020 and beyond we will be able to stop the manipulation of our primary elections and remove most of the RINO's from office going into Trumps second term. We will see what happens, but for now, our course is clear. We must hold our ground and to do so we must turn out a huge vote in November and elect every Republican on the ballot because it is in our own, and our nations, best interest to do so. It's not about them, it's about US! I thank you for all that you do for our state and our nation and I have no doubt that once again you will do your Duty as a US Citizen and Ohioan. If we are a nation of the people, by the people, and for the people, then We the People need to do our Duty and take the necessary action to decide who will represent us and our goals and to defend our Constitution and our Liberty. Losing is NOT an option. Only YOU can make sure that we crush our communist opponents in November! Let's get 'er done! The national landscape is rife with Democratic officeholders and candidates who proudly wear the “resist Trump” label. But in Ohio, Sen. Sherrod Brown is not being so bold. 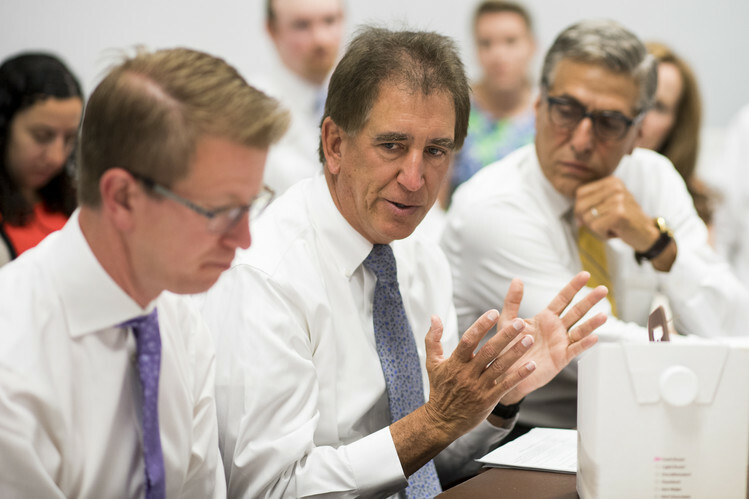 Brown faces a challenge from Republican Rep. James B. Renacci, who made a campaign stop in Hillsboro a few days ago and dropped by the offices of the Times-Gazette. Most observers agree that Renacci’s effort to unseat Brown is an uphill battle but not an impossible one. Donald Trump won Ohio by eight points, and Renacci is hitching his candidacy firmly to President Trump’s bandwagon. He spent much of his visit to our newspapertouting his relationship with Trump, who endorsed himin the primary. While an early pollshows Brown with a comfortable advantage, most observers expect the race to tighten come November. Over the weekend, Renacci touted a Trump super PAC pollshowing him trailing by just four points. Senate Majority Leader Mitch McConnell (R-Ky.) recently told the Hillthat “I would certainly add Ohio to the list” of possible GOP pickups. Brown, a former Ohio secretary of state and congressman before his election to the Senate in 2006, is at the left endof the political spectrum for a moderate swing state. So you’d expect the Renacci-Brown matchup to be the usual faceoff between a pro-Trump conservative and an anti-Trump “resistance” liberal. But that’s not how Brown is playing it. News releasesfrom Brown’s office in recent months provide examples of the tightrope he’s trying to navigate. In mid-March, a subhead on a Brown release on opioid legislation blared, “President’s Plan includes Brown Initiatives to Boost Treatment.” A few days later, Brown issued a statementsaying he “welcomed news that the Trump Administration is taking steps to crack down on China’s violation of intellectual property laws,” adding, “Earlier this month, President Trump answered Brown’s call to crack down on unfair steel imports that have hurt the U.S. steel sector.” The week after, another Brown statementdeclared the senator “is applauding the Trump Administration’s work to renegotiate the Korea-U.S. Trade Agreement and block Korean steel dumping.” Similar words of praiseand various degrees of agreement with Trump have followed. To be sure, Brown often includes caveats that make clear his differences with the president. And he is vocal in his oppositionto the tax-cut package passed last year and Trump’s approach to immigration. But while many Democratic candidates are proud to wear the resistance label, Brown wants nothing to do with it. It was telling that Brown’s first attack ad after the primary didn’t mention Trump. Instead, the ad — which PolitiFact rated “Mostly False”— accused Renacci of being a lobbyist while serving in Congress. And when I asked a Brown spokesman to respond to Renacci’s charge that Brown is an obstructionist to all things Trump, he was quick to highlight Brown’s work with Trump on issues such as opioids and trade. Why? Brown understands that many Ohio voters — including his base of blue-collar workers, many of whom support the president — see Trump’s actions differently from the liberal national media and Democrats in the coastal blue states do. Rather than Trump abandoning Group of Seven allies, they see the president as finally standing up for the best interests of the United States. Rather than fixating on dwindling evidence of Russian collusion or obstruction of justice, they’re focused on the best economy in decades and a North Korean dictator pressured toreleaseprisoners and forced to the negotiating table by the president’s hard-line approach. Statewide races in Ohio usually come down to turnout in the Democratic northern strongholds vs. enthusiasm in Republican southern counties. Can Brown play the occasional game of footsie with the president and still engender the anti-Trump fervor necessary to offset pro-Trump turnout for Renacci? If Brown hopes his occasional agreements with Trump will neutralize the president, he’s overlooking a lesson everyone should know by now: Trump will not be ignored. The midterms will be a referendum on Trump, state by state. If the media weren’t making sure of that, Trump would. In Ohio, Renacci is all in with Trump. Brown is trying to keep a toe in the water, but that water could come to a boil very soon. Akron, OH: Today, the Ohio TEA Party organization, the We the People Convention, released the results of a state poll of confirmed Republican primary voters that shows that Mike DeWine has a commanding 22% lead over Mary Taylor in the Republican primary for Governor, while Jim Renacci has an even more commanding 24% lead over Mike Gibbons in the US Senate Republican primary with 70 days left before the May 8, 2018 primary. The poll also indicated that 84% of Republican primary voters did not think that it was right for the Ohio Republican Party State Central Committee to endorse candidates before the primary election. The telephone poll was conducted for the We the People Convention by TRZ Communications Services of Akron, OH, on Saturday, February 17, 2018. It included 1,152 randomly selected and confirmed Republican primary voters with the poll results having a 95% confidence level with a ± 3% margin of error. This poll was conducted using the same methodology as the poll taken in late October 2016 which was the ONLY poll in the nation to accurately predict, within 2% points, the Trump win in Ohio. Tom Zawistowski, President of the We the People Convention, said, "These poll results are very disappointing to all lovers of liberty, and particularly conservative Republican voters, who believe in our electoral system and believe that the citizens should get to vote for who they want to represent their political party in the general election. These results prove what Donald Trump said all of 2016, and what Bernie Sanders supporters know for a fact, the system is rigged against the will of the people by the establishment in both political parties. The establishment has taken away the votes of the people by manipulating who is running for Governor and for US Senate on the Republican primary ballot and by the Ohio State Republican Party picking winners and losers by violating their Chairwoman's promise not to endorse during the primary. Actions which 86% of Republican primary voters in our poll said were wrong. Our organization will not endorse in the Governors race, as it is foolish to spend any time or effort participating in a rigged game. In fact, a separate poll of Liberty Group leaders conducted this month showed that 68% wished that they had another option in the Governor's race, after Renacci was pushed to the Senate race and Husted had joined with DeWine, and did not want to support either DeWine or Taylor. Our best option may be to recruit a team of business conservatives, like Trump, to run as Independents for Governor as the choices provided by both the Republican and Democratic Party do not represent the values or the will of the majority of Ohio voters." Zawistowski continued, "The loss of Josh Mandel as a Senate candidate was devastating to our activists who had spent six years supporting him and were very much looking forward to carrying him to victory over Sherrod Brown. We endorsed Mike Gibbons for US Senate on the day that Josh Mandel dropped out, but it is clear, now that Jim Renacci has entered the race, that he has the backing of President Trump, the entire Ohio US House Caucus including Jim Jordan and Warren Davidson, the national and state Republican Party, and has a commanding lead in the polls. We will wait to see how the Senate primary plays out and let the voters decide, then we will support whichever candidate wins in an effort to unseat Sherrod Brown. The main priority of the Ohio TEA Party Movement this year is to protect the US House of Representatives so that our agenda for America can continue under a Trump Presidency. Therefore, we will endorse shortly in contested Ohio US House races and use the vast majority of our time and effort to elect the most conservative candidates we can in the primary and in the general election. Fortunately, the establishment did not manage to rig those elections prior to the filing deadlines and the voters have some excellent choices, even in current Democratic held seats, thanks to the TEA Party recruiting challengers in those races. We will also look at some Ohio House and Senate races and local races where we will endorse via our state PAC, the Ohio Citizens PAC. Interestingly, our poll showed that even though the Ohio Republican Party voted to endorse incumbent establishment candidates, 55% of Republican primary voters trust the endorsement of the Ohio TEA Party Movement more than that of the ORP. Indicating that our federal, state and local endorsements will be very valuable in the primary for those candidates who share our conservative values and who we choose to endorse and support in the weeks ahead." Voters can learn more about federal candidates the We the People Convention supports, and donate, at www.WethePeopleConvention.org. Voters can learn more about state and local candidates the Ohio Citizens PAC supports, and donate, at www.OhioCitizensPAC.org. Good News for Conservatives this Week! Despite all of our concerns, all of our worries, about the future of our great Nation, today we are going to gain much perspective and celebrate the Good News! This week President Trump decertified the horrible Iran Deal, he signed an Executive Order that guts Obamacare and allows insurance companies to sell across state lines to associations of small businesses and more, the EPA announces the end to the destructive and illegal "Clean Power Plan", and he is winning the fight against the NFL and it's players who are protesting the lie that white cops are just gunning down black men because they are racist when nothing could be further from the truth! These people are doing a fantastic job of linking every story about the good that is being accomplished that I am going to make it my HOME PAGE on my browser! Please take a look and share it with everyone you now! I hope that this email helps you to see that we are winning, however slowly, and that we must persist in our efforts to take back our Government from the "Ruling Class" and the deep state and restore Representative Governance! I hope this email finds you well. I thank you for ALL that you have sacrificed for our Freedom and Liberty! Click Here if you would like to make a Donation to Support the efforts of the We the People Convention! Click HERE to see the original Article and a Video with PCTEA Member interviews in it. President Donald Trump is leaving his mark on the Republican Party, with political candidates across the country shaping themselves in his populist, antiestablishment mold. In races for Congress, governor and other offices, dozens of insurgent Republican candidates are touting their ties to Mr. Trump, echoing his slogans and seeking his endorsement against GOP rivals who are more conventional. Some of these Trump-inspired candidates are political neophytes. Others are conventional GOP politicians who have repositioned themselves as outsiders as they gear up for Republican primaries in 2018. Their fate will help determine whether Mr. Trump turns out to be a one-of-a-kind political phenomenon or whether he will have a lasting impact on the next generation of Republicans. Mr. Trump has pushed the GOP in new policy directions, such as being more cautious about free trade and less concerned about reducing the federal deficit. The arrival of a wave of like-minded House and Senate members could make it far easier for the president to turn those ideas into law. His presidency is already reframing GOP primaries, which for the past generation have largely been contests over which candidate is the most conservative. Now the question often is: Which candidate is the Trumpiest? These campaigns are fomenting more antiestablishment rhetoric within the Republican Party, where divisions are growing between Mr. Trump and some top lawmakers, including Senate Majority Leader Mitch McConnell (R., Ky.). Democrats hope that any candidates who sound like Mr. Trump will be easier to portray as extremists and that competition for Trump supporters by Republican candidates will alienate swing voters. 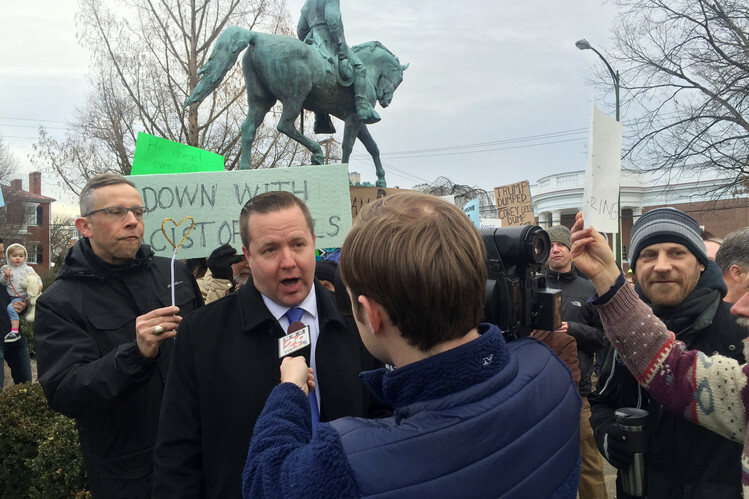 In the swing state of Virginia, former Trump campaign aide Corey Stewart, now running for the Senate, defends the Confederate flag and vows to crack down on illegal immigration. GOP candidates in Mr. Trump’s mold are most common in states he won in November, such as Alabama, Georgia and Ohio. But even in the swing state of Nevada, where Democrat Hillary Clinton won in November but Mr. Trump won the GOP primary, Republican Sen. Dean Heller is facing a primary challenge from Danny Tarkanian, a pro-Trump businessman. Both political parties have undergone occasional makeovers. In the 1990s, President Bill Clinton transformed the Democratic Party into a more centrist, business-friendly political force. Republican Ronald Reagan’s election in 1980 was a triumph for the conservative movement and marked the beginning of the end of the GOP’s dominance by moderates. Mr. Trump has signaled some interest in shaping the party more directly through endorsing or encouraging primary challengers to Republicans who have crossed him. That is unusual because presidents usually try to avoid weighing in on intraparty fights. In a tweet in mid-August, Mr. Trump praised the Republican primary challenger to Sen. Jeff Flake (R., Ariz.), who wrote a book that includes criticism of the president. Mr. Flake replied that he would take his cues from Arizona voters, not the White House. In Alabama, Mr. Trump backed Sen. Luther Strange in a special election for the Senate seat vacated by Attorney General Jeff Sessions. The endorsement was seen by people close to the race as inspired as much by opposition to one of Mr. Strange’s opponents, Rep. Mo Brooks, as enthusiasm for Mr. Strange, a mainstream politician. Mr. Brooks had criticized Mr. Trump during the 2016 campaign and more recently for feuding with Mr. Sessions. Mr. Strange placed second in the primary to evangelical conservative Roy Moore, and the two men will be in a Sept. 26 runoff. Some GOP strategists warn that Mr. Trump’s political appeal might not be transferable to other politicians, no matter how hard they try. Still, Mr. Trump has clearly made it more acceptable for GOP candidates to openly respond to voter frustrations about Washington with a provocative, populist message, as Mr. Trump did on the campaign trail. 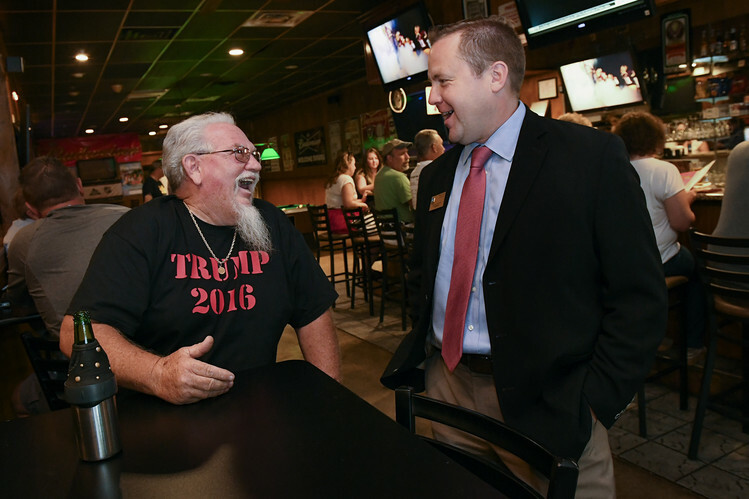 Some Republicans see the emergence of Trump-like candidates as an important step in making the GOP more responsive, especially on pocketbook issues. But those candidates can also be more divisive than traditional Republicans, worrying some party officials about their general-election prospects. The first such candidate to make a big splash was Mr. Stewart in Virginia. He was Mr. Trump’s campaign chairman in Virginia for part of the 2016 campaign and lost the Republican primary for governor by just a percentage point in June to establishment favorite Ed Gillespie, former chairman of the Republican National Committee. In July, Mr. Stewart said he would try to defeat Democratic Sen. Tim Kaine next year. Mr. Williams compares his underdog status to Mr. Trump’s at the start of the GOP presidential primaries last year. “They said that about Donald Trump, too” Mr. Williams said in an interview with right-wing news site Infowars. With or without Mr. Trump’s support, some Republican candidates are invoking him as a signal to Trump voters. In Indiana, Rep. Todd Rokita announced his Senate bid in August and released a campaign video that features footage of a Trump campaign rally. “Take the next step,” the video says. Before the announcement, Mr. Rokita circulated a letter from Mr. Trump’s top campaign leaders in Indiana that vouched for the congressman’s loyalty to the president. In Ohio, Mr. Trump has helped reshape the GOP from the top down. After winning Ohio by 8 percentage points, Mr. Trump successfully lobbied for replacing the Republican Party’s state chairman, Matt Borges. Mr. Borges was an ally of Ohio Gov. John Kasich, a presidential primary rival of Mr. Trump. 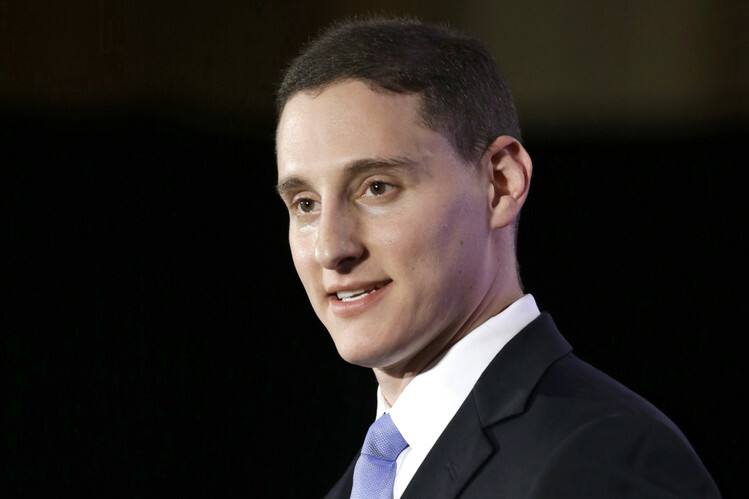 Even established Ohio politicians like State Treasurer Josh Mandel are starting to sound more like outsiders. Mr. Mandel is trying for the second time to unseat Democratic Sen. Sherrod Brown and has put new emphasis on sanctuary cities, Islamic radicalism and other issues promoted by Mr. Trump. Mr. Mandel’s primary rivals include Mike Gibbons, a Cleveland businessman who is a political novice in the Trumpian mold. Mr. Gibbons, a top Ohio fundraiser for the Republican Party and the Trump campaign in 2016, says he doesn’t always agree with the president’s bombastic style but was inspired to run for the Senate by a similar frustration with the Washington establishment. Novice GOP candidates often face one of the same daunting challenges that Mr. Trump did. Establishment-backed candidates usually have a big fundraising advantage. Mr. Gibbons’s campaign had $602,000 in cash at the end of June, the latest period for which figures are available. Mr. Mandel, endorsed by Ohio’s other senator, Rob Portman, had $3.4 million. In the gubernatorial race, recent polls show Mr. Renacci way behind better-known, well-funded GOP rivals such as former Sen. Mike DeWine, Ohio Secretary of State Jon Husted and Lt. Gov. Mary Taylor. Mr. Renacci’s campaign slogan is “Ohio First,” an echo of Mr. Trump’s promise during his own campaign to put “America First.” Like Mr. Trump, Mr. Renacci is funding his campaign in part with wealth attained as a businessman. The total is $4 million so far. Former Trump campaign manager Corey Lewandowski headlined a Cleveland fundraiser for Mr. Renacci, who has been endorsed by the groups Bikers for Trump and Citizens for Trump. The president hasn’t endorsed Mr. Renacci, but his website includes video from a June event where Vice President Mike Pence praised Mr. Renacci. “I was for Jim Renacci before it was cool,” Mr. Pence said. Mr. Renacci is trying to appeal to voters like Harvey McClary, a retired auto worker from Diamond, Ohio, who came to Ravenna to see where Mr. Renacci stood on the president’s response to the violent white supremacist protest in Charlottesville, Va.